One of Asus’ latest Z97 motherboard, the fully featured Asus Z97-Deluxe (NFC & WLC) is now available. The Asus Z97-Deluxe (NFC & WLC) is jam-packed with lots of features and accessories like Near Field Communication, Wireless Charger, Thunderbolt 2 and many more. It also features a one-click total system optimization and fastest WiFi 802.11ac connectivity. Check out the rest of its features, specifications, price and where to buy below. 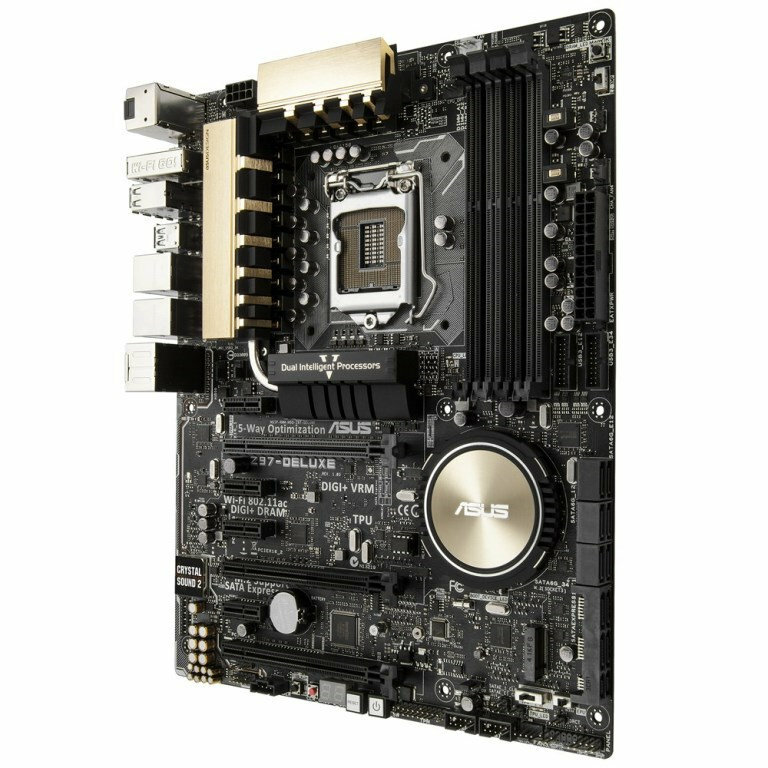 The Asus Z97-Deluxe (NFC & WLC) is one of the most fully featured Asus Z97 motherboards. It has 5-way optimization by Dual Intelligent Processor 5, M.2 and SATA Express ports, Crystal Sound 2 and dual Intel Gigabit Ethernet ports, Asus HomeCloud with 802.11 ac Wi-Fi, ThunderboltEX II/Dual, NFC Express 2 and Wireless Charger (WLC) and many more. Let’s take a look at these features one by one. The new Asus Z97-Deluxe (NFC & WLC) features the new 5-Way Optimization by Dual Intelligent Processor 5, which optimizes the essential part of your system. Before it was only a 4-way optimization, but now latest Z97 motherboards can optimize 5 essential area of your system, namely: CPU performance, energy saving, precise digital power control, fans, and networking and audio settings. In other words, with the 5-way optimization games will run swiftly and smoothly with high performance, prioritized bandwidth and vivid sound; fans stay whisper-quiet for everyday computing and ensure extreme cooling efficiency when gaming; movies play without stutter; and energy waste is reduced so you’ll save money. The Asus Z97-Deluxe (NFC & WLC) also features Fan Xpert 3 which can control the different 4-pin and 3-pin PWM or DC fans connected on the motherboard. Fan speed can be configured from ultra-low to high performance depending on your system’s needs. There are also several onboard thermal sensors for monitoring the different temperature of your system. All Asus Z97 motherboards, including the new ROG and TUF series, feature a new UEFI BIOS. The previous UEFI BIOS was great but the new version in the Z97 motherboards is even better. You also get an EZ mode and Advanced mode, plus you get even more control of your system than before. The new Asus Z97 Deluxe (NFC & WLC) makes it easy for you to overclock your processor and your memory. Overclocking your processor can be done easily via the new AI Suite or if you want more control, you can do it via the new UEFI BIOS. You can also overclock your system’s memory up to 3300MHz, thanks to Asus’ T-Topology design that provides superb memory overclocking capability under full load by minimizing the coupling noise and signal reflection effect. One of the new features in the Intel 9 Series based motherboards is the support for built-in M.2 PCIE 2.0 port which supports up to 10Gb/s data-transfer, breaking the SATA III 6Gbps barrier speed. The new Asus Z97 Deluxe (NFC & WLC) also features two SATA Express ports, providing up to 10Gbit/s data-transfer speeds from two PCIE 2.0 lanes, resolving the higher bandwidth request in the near future. The Asus Z97 Deluxe (NFC & WLC) also features ThunderboltEX II, the first Intel-certified Thunderbolt 2 add-on card, offering the flexibility to upgrade your own build to Thunderbolt 2 technology whenever you want. You can enjoy bi-directional transfer speeds up to 20Gbit/s and experience video in incredible detail on the latest 4K/UHD (ultra-high-definition) displays while using bandwidth-hungry storage devices at the same time. The new Asus Z97 Deluxe (NFX & WLC) also features Crystal Sound 2 audio core. It has audio shielding, EMI cover, Audio amplifier, unique de-pop circuit, and has premium Japanese-made audio capacitors, giving you superb audio quality, clarity and fidelity. This motherboard has also lots of wired and wireless connectivity options. It features two super-fast Gigabit Ethernet ports featuring Turbo LAN with cFosSpeed traffic-shaping technology. It also features a 2T2R Dual Band 2.4/5GHz 802.11ac WiFi up to 867Mbps, with WiFi Go!, making it possible for you to access your PC fast and easily even if you are away from your home. Finally, this is the only Asus Z97 motherboard that comes with a NFC Express 2 (Near Field Communication) and WLC (Wireless Charger) docks, making it possible for you to interact and recharge your mobile devices wirelessly. Check out the rest of its features and specifications on the table below. The Asus Z97-DELUXE (NFC & WLC) is now available for only $399.99. This motherboard is one fully featured motherboard and is also the most expensive Asus Z97 motherboard so far. 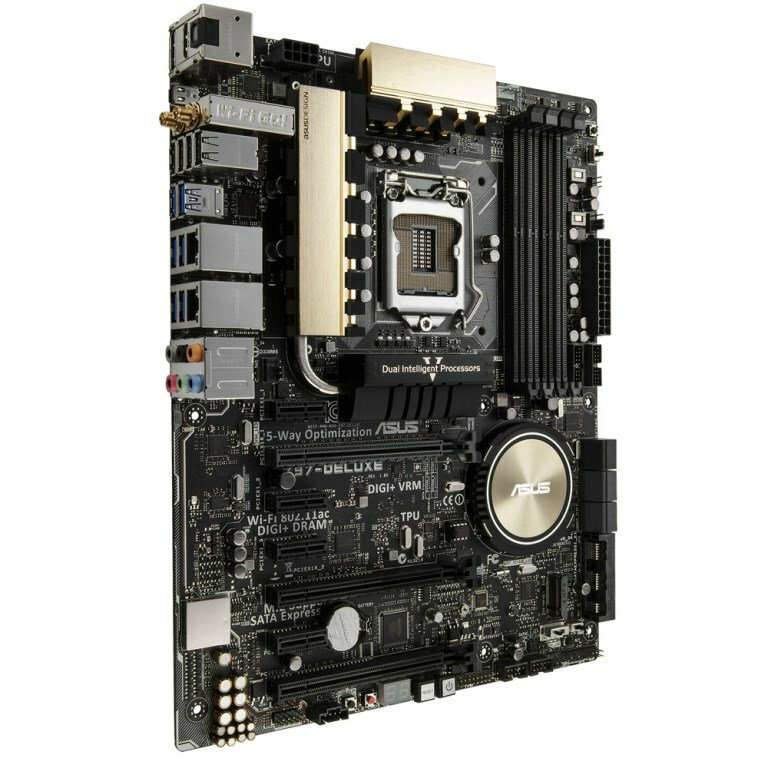 If you think you don’t need some of the features in this motherboard, there is also the less featured Asus Z97-DELUXE for only $289.99, or the more affordable Asus Z97-PRO (WiFi AC) for only $219.99.